When O’Reilly gave me an opportunity to review this book I was excited. It gave me a reason to finally put some time into this new platform and what developers will need to learn in order to be successful. This book by Ben Dewey is only 92 pages long, so if you were looking for an in-depth treatment of Windows 8 development you will need supplemental materials. It is also due for an update from the perspective of recent changes made by Microsoft prior to the final release of the OS and tools. This causes a few issues if you try to run the code samples because of namespace changes. The lifecycle is critical for anyone who hasn’t done mobile development before. Limited resources on these devices mean that the OS can suspend or kill your app altogether if it decides it needs to. He covers tombstoning which is the key to Windows 8 and Windows Phone lifecycle management. He also dedicates a chapter to marketing and distributing the application you build. From my experience with Windows Phone development this is crucial information. You need to know how to test your application so that it is going to pass certification and present your app so that it is going to get noticed amongst thousands of other apps. The main things that I wish had been in the book explanations of more of the common controls and more complete explanation of patterns that were implemented. In the end this book is a good foundation getting exposure to the concepts that underlie this new version of the Windows platform and how it effects developers. It isn’t a book that I would suggest for someone just getting into development with no understanding of pattern based development. So I have finally dried the tears after watching the Keynote for Build 2012. This wasn’t because it was an emotional presentation, but because for the second year I missed the goodies. Each on site attendee got a Surface RT, a Lumia 920 and a voucher for 100GB of SkyDrive storage. The event was opened with the announcement that in the three days since the launch of Windows 8 over 4 million upgrades have been sold. I don’t care who you are that is an impressive stat. Ballmer then spent a fair amount of time remaking the case for the Windows and Windows Phone platforms similar to what we have heard over the last to launch events. There were some cool, but non-essential demos. The one that was the most fun was the Perceptive Pixel 82” slate device. At first glance I wondered why I would ever want such a device, but then Ballmer explained it’s possible use for schools and boardrooms. The actually made sense. Then things got strange. Steve started explaining features that developers could leverage. Usually this type of information is left to the product leads. He focused on the integration with the Charms features such as Search and Share. Steve “Guggs” Guggenheim showed off an app that would appeal to my kids from Disney called “Agent P” which is base on Phineas and Ferb. Then he got to the meat of the presentation. We found out that you could add a tile that can be used to sell ad space. In the same vein we also found out that you could use Microsoft’s, Paypal’s or any commerce engine of your own creation or choosing. For those who are interested in sports and especially developing sports apps you would have found the small presentation from Michael Bayle of ESPN. He introduced the ESPN app which has tons of features. For the developers in the crowd he also mentioned that ESPN has an API available at developer.espn.com. During the launch events we were told apps were coming. In this presentation we were actually shown a scrolling list of logos and told about a couple of them. Ballmer mentioned specifically Twitter, SAP and DropBox. These are impressive names that were just a couple of the list impressive names. Steve Ballmer addressed the question of why you should develop for the Windows 8 platform. He feels that Microsoft has the best commercial terms for developers, a better way to build apps than other platforms and a variety of form factors. His key point though was the available volume of customers given the current Windows install base and assuming even a flat growth of the platform. This he backed with a promise that Microsoft is going to do better at marketing and you won’t be able to avoid the ads that they are bringing out. The last section of the key note was present by Kevin Gallo from the Windows Phone team. This was the real reason I tuned into the webcast. He impressed upon those watching that the strength of developing for the Microsoft platform is the common programming model that now exist. While there are difference between form factor implementations you can leverage code across them. The quote from Kevin that stood out for me was that “Take your Dramamine and buckle your seatbelt type of games are coming to Windows Phone 8”. He back this up by displaying a list of game development frameworks and then having Unity come out and do a demo. The last two things of note for me were the announcement that the SDK is immediately available at dev.windowsphone.com and that they were reducing the cost of an individual developer account to $8 for the next 8 days. Today was the official coming out party for Windows Phone 8. Below is a summary of the launch event. There is a lot here to stay with me. They started with a commercial staring Joe Belfiore show how his Windows Phone 8 was personal too him which highlights something I think Microsoft has done well over the last couple of event: spotlight how Windows Phone is a different experience from other smartphones. Joe actually called iPhone and Android “tired old metaphors" and explained that the idea around Windows Phone was to “reinvent the smartphone around you” as “the most personal smartphone operating system”. The is the message that they need to drive home in their adds. The only real technical aspect we found out was that they have optimized the operating system around the dual core Qualcomm Snapdragon chip set. It seems like all of the other hardware goodies had already been announced. The remainder of the event was centered around new features of the OS and app announcements. So what are we getting? The integrated features included lock screen live tile, Data Sense, Rooms and Kids corner. There wasn’t a lot of information about it, but Joe also talked about apps not just having live tiles, but being live apps that could integrate with wallet and the hub. The lock screen will now be able to be personalized with live tile data or even a photo slide show. This gives the lock screen an even better ability to give you the information you want to know before you even unlock the phone. The Kids Corner allows you as a parent to setup an area on your phone that you kids can go into an use it without disturbing your apps. They can play games or use apps that you have designated and will only see those apps. It even has a special lock screen gesture just for the kids corner. Rooms allow you to organize your phone around the groups of people in your life. You get a shared calendar, a room wall as well as shared notes beyond just being able to send messages to a group. You can also invite people not on the Windows Phone platform to access an online version of the room. Data Sense is a new feature that gives you better control and understanding of your data plan usage. You can see which applications are using data and it can automatically adjust they way your phone behaves as you get close to your data limit. Add to these features the fact that the entire Windows ecosystem is integrated with SkyDrive and you have an available anywhere experience that is unequaled by any other platform. Your document, photos and music are available on your Windows Phone, Window 8 device and Xbox. SkyDrive also doesn’t limit how long you can keep files like the competing cloud platforms and give more free storage. It was interesting the way they made the launch event more personal. First Joe brought out his own kids to demo the Kids Corner. They followed this up by bringing out Jessica Alba to discuss her experience on the Windows Phone 8. They need to keep putting a face on the product instead of just showing features as a cold list. Then we get to apps. We knew that the new Skype was coming, but we found out that it was created in such a way that it can receive calls without running consistently in the background which would eat up battery. This announcement was follow by the coming Facebook app that is optimized for Windows Phone 8. As a matter of fact they indicated that just after launch the marketplace would have 46 out of the top 50 apps used by all smartphone platforms. In a rational world this tide with over 120,000 apps currently in the marketplace there should be no more argument about the Windows Phone ecosystem. For those of us who develop for Windows Phone and weren’t on the early adoption program will finally get access to the SDK tomorrow after an announcement at Build (more waiting). Perhaps we will get a few new features then. In the end I wouldn’t say there were any huge surprises, but I am really excited about getting my hands on the devices next month and starting to develop. Stay tuned. Today was a big day for Microsoft with two separate launch event. The first for Windows 8 and all of it’s hardware partners. The second was specifically to introduce the Microsoft Windows 8 Surface tablet. Below are some of the take-aways I got from the webcasts. The three general area that Microsoft focused on were the release of the OS itself, the public unveiling of the Windows Store and the new devices available from its hardware partners. The release of the OS focused on the fact that it will be available at mid-night tonight for both new PCs and for upgrades. I can’t say that this interested me that much since it was already known to most people. I think what they did show well was how easy the OS really is to use. The Windows Store is also not a new feature to those of us who have been running the pre-release versions of Windows 8 or have owned Windows Phone 7 for the past 2 years. What was interesting is that the Windows Store launches with more apps available than any other platforms store at their respective launch. I think this says a lot about how Microsoft focuses on the ability of developers to create software and make it available. The of course were sure to emphasize that the Windows Store has better monetary terms for developers than its competitors. The also showed off the fact that XBox Music streaming is available for to all Windows 8 user for free. Couple this with the Bing suite of apps that give you news, weather, sports and finance right out of the box and I think most people will find the environment a joy to use. I think the hardware demo, while quick and furious, really show where Windows shine: CHOICE! They made a statement that over 1000 devices have been certified for Windows 8. They showed tablets, laptops, desktops, all-in-ones and convertibles. Since these devices have industry standard connectors they give a much wider variety of accessories and devices that you can use with them. Steve Balmer then came on stage and tried to see how many times he could use the “magical”. He focused on how the Windows 8 OS is designed to integrate with SkyDrive, Skype and Outlook.com. He also enforced that they think Windows 8 is the best choice for the Enterprise when it comes to protecting data and integrating across devices including Windows Phone 8. With that we were left to wait for the second event of the day. The second event of the day started with kids with magnets. Ok, they were adults, but who doesn’t like playing with magnets. Steven Sinofsky detached and reattached the Surface keyboard repeatedly, clearly enjoying himself. It turns out that there are 4 magnets in the cover, 2 for alignment and 2 as connectors. They then went to giving us the details on the display. The 10.6” display is optically bonded to the case and is optimized to reduce glare. I think this came through very well in the demonstrations. The properties of the case were also a great selling point. The VaporMg allowed them to drop the device on stage, on purpose, and continue working. Of course they had to bring out the skate boards made from Surface devices. “It just has to feel right” was the reason they gave for many of their design decisions from the weight and size of the device to the way the kickstand and camera work together. While this gave you the feeling that the whole process was trial and error you could tell that a lot of science went into the specs. This included making sure that the magnets were strong enough to hold the cover on and still have a 3 year old remove the cover without effort. I am glad that they also decided the a USB port would be part of the spec since it give so many options. They made the point that this allows Surface to leverage over 420 million existing devices. That works for me. The last feature that I really thought was important was the microSD port. Begin stuck with the onboard memory has been an aggravation of mine with many of the devices in the market today. I think they did job of really getting the audience to understand why you want this platform and this particular device. Using personal examples like creating a video of a birthday party and being in it or the fact that the device was being used to live blog the event and control the lights and presentation. They showed very well that it was not only fun but very capable of getting real work done. Handing out tablets to the crowd didn’t hurt either. In the end I really wanted a Surface even though I really have no need for one on a daily basis. Great job Microsoft! 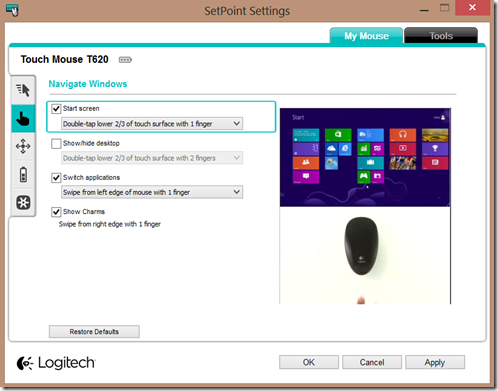 It isn’t very often that I worry much about hardware, but since I heard some others talking about “touch” mice for their Windows 8 machines I figured I would try one out and see what the experience was. 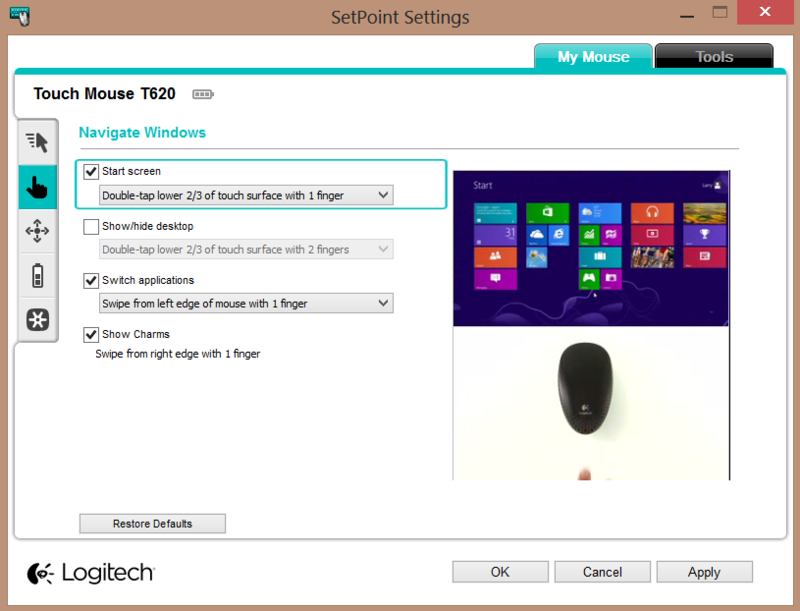 The only Windows 8 compatible touch mouse that they had in the store was the Logitech t630 Touch Mouse. At $69 it isn’t exactly a cheap purchase. So how does it work with Windows 8. First it works well as a normal mouse with touch scroll capabilities. Scrolling works both horizontally and vertically. Then you get into to the Win8 features, all of which are associated with the back 2/3 of the mouse. If you double-touch-tap (not depressing the internal button) it acts as a Windows home screen button. The next feature is switching applications. This is accomplished by dragging a finger from the left edge of the mouse in. Bringing up the Windows 8 open apps list is the same movement as on the table where you drag in from the left and then move back to the right. The last gesture available is to bring up the charms. This is performed by dragging in from the right side of the mouse. There is a certain amount of configurability. You can switch dominant hand configuration as well as turn on and off gestures as shown in the screenshot below. It is nice that they kept the gestures similar to the table gestures. Hopefully future updates to the drivers will bring other gestures, but this is definitely a good start. 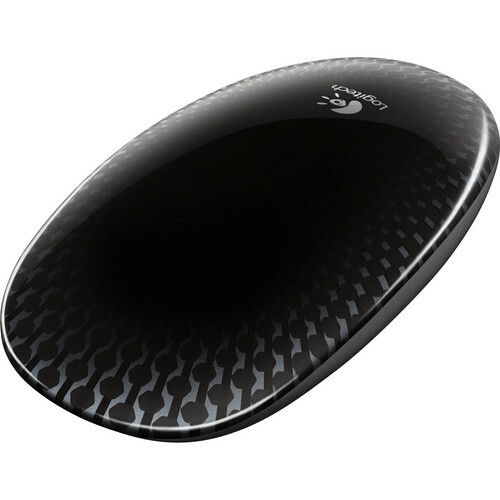 It would be interesting to also compare this to the Microsoft Touch Mouse and see if there are additional gestures such as app close and for the app bar. The year is quickly coming to an end. This is the most exciting part of the year with technology manufacturers in overdrive trying to release as many products for Christmas as possible. Our group is trying to do our part to bring order to the madness with one last presentation for the year. Norman Murrin will be speaking on November 20th on Adopting Agile Processes in the Enterprise. Be sure to join us by registering at the link below. It seemed very ironic that the day we have a presentation on the architecture of building applications for Windows 8 the Surface tablet is opened for pre-order. Tom Benton started the evening enlightening the attendees on the user experience for those who had not seen it yet. He even passed around his table from last year’s Build conference for everyone to play with. This was followed with a tour of the capabilities and structures that make up a Windows Store App on Windows 8. Taking it to its conclusion, he rounded out the discussion by covering the certification and deployment process. As usual it was great to see a lot of familiar faces last night. We are always looking for more people to join in our discussions. Stay tuned here for announcements up upcoming meetings and topics. Also, if you have a topic you would like to present or see presented feel free to contact me through this blog.